We ran into a guy with a pet bear. I felt like I was in a John Irving book! Every now and then my parents let us kids decide where to go for the family vacation. 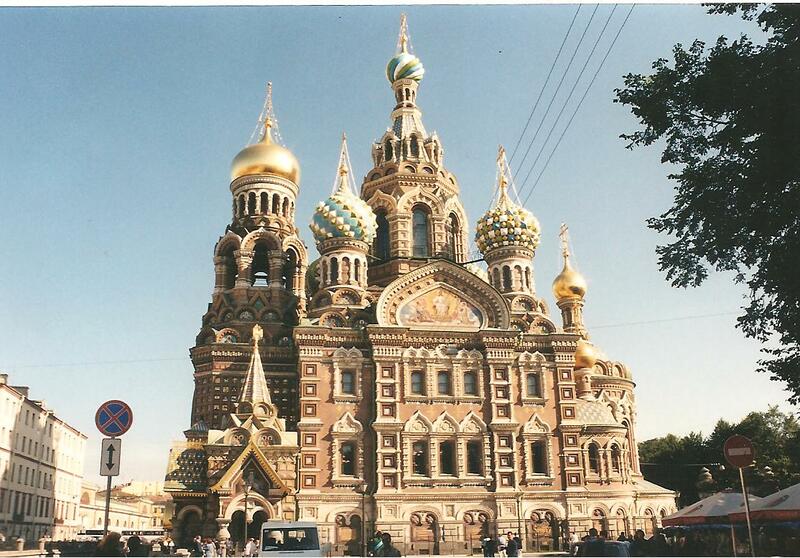 My brother, who was interested in Russian history picked St. Petersburg. I had traveled a lot by that point but I was unprepared for such a unique country. We happened to go for the tricentennial of St. Petersberg. If you know nothing about Peter the Great, he’s definitely an interesting character. He is credited with Westernizing Russia. He made all the Russian officials move from Moscow to what was basically swampland and called it the gateway to Europe. He traveled around Europe getting ideas for his great city and for ideas on how to govern his country. I call St. Peterburg the cliff notes version of Europe because it has the canals of Amsterdam and Italy, French architecture, a world-class art collection, and the cosmopolitan feel of London or Paris. We went to at least three or four museums and castles each day! And if that wasn’t enough, during the summer they have White Nights so it was still bright out at midnight! We were immediately stunned by the Church of Spilled Blood (It has a thousand different names). It looked like it was made out of candy. No picture I’ve seen has captured the bright, intricate details covering the entire building. We went out of our way to visit this church every day of our 8 day trip. And if you think the outside is spectacular, the inside was just as amazing! 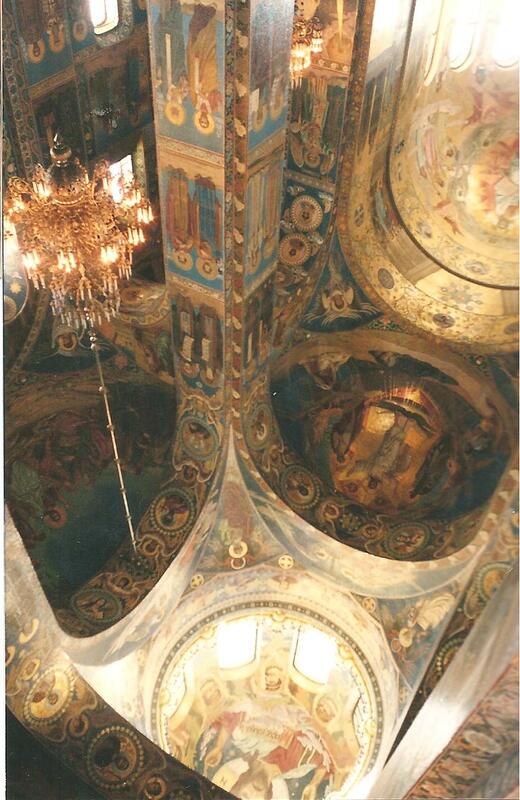 The interior of The Church of Spilled Blood. This is all tile mosaic. The shear size of the castles and museums were stunning. We spent 12 hours at the Hermitage and didn’t see a quarter of the art. Anyone that’s traveled to Europe will probably say they got tired of the castles after awhile, but the castles here are out of this world and every room was more breath taking. Every thing was covered in gold, or velvet, or murals. It was the first country I visited where most people didn’t know a word of English- although I’m sure that’s changed in the last 10 years. Even the written word was indecipherable because they use a different alphabet (Cyrillic). There were hardly any signs of American pop influence which was refreshing. I’ve never understood why people travel thousands of miles to eat at a Hard Rock Cafe and shop at a Gap. I will always love St. Petersburg because I had the best meal of my life there. We followed an incredible scent to a hole in the wall restaurant (actually it was in the basement and you had to duck to avoid the rafters). I ordered beef stew and wine from Georgia. I don’t understand what was in that stew but I’ve been pining for it ever since. And that wine – it was the only glass of wine where I actually tasted all the things a wine connoisseur “says” they taste when they drink wine. Hints of plum, sun soaked cherries, and just a touch of raw earth, or whatever. IT was really good. Don’t miss Catherine the Great’s Winter Palace. It’s a bit out of the way but the water fountains are spectacular. We had to take the subway, and had no idea how to read the signs. An old lady noticed our panic and I guess she asked if she could help in Russian. 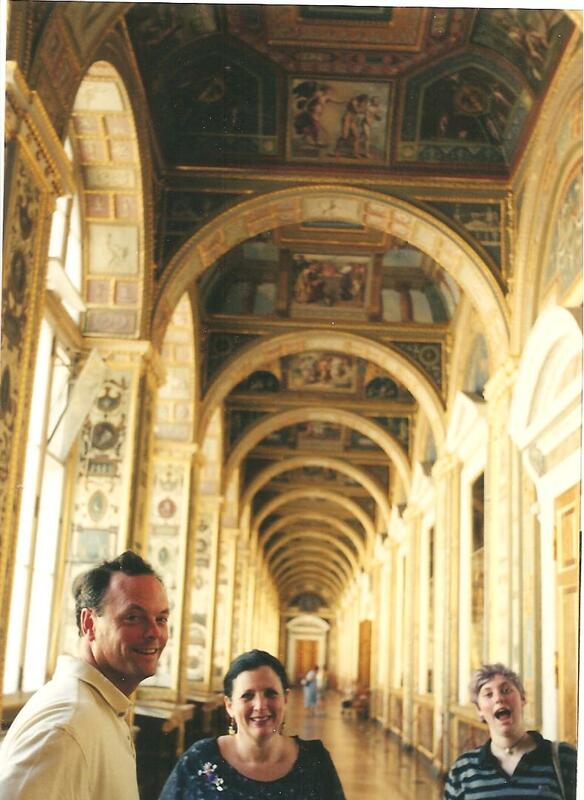 We pointed to the picture of the palace in our guide book and she took my brother’s hand, and we followed. She stayed with us for two subway transfers and helped us out when we arrived. Then she disappeared into the crowd like a magical babushka. The palace sells a limited amount of tickets and we were out of luck – that is until we bribed a guard and he let us in! To Russia with Love. “Peter” – how we, Russians, call it is a true gem of Russia .. Great post! You bring back many fond memories my dear! Ooooo. Another place that I would love to visit but have so far not had the chance. In particular, there is something called the Amber Room. Did you get a chance to see that? And funny about the decadent imperialistic capitalist bribe working in socialist Russia. We did see the Amber room in Catherine’s Palace. It was decadent and gorgeous – just like the rest of St. Petersburg! Hope you get to see it one day! 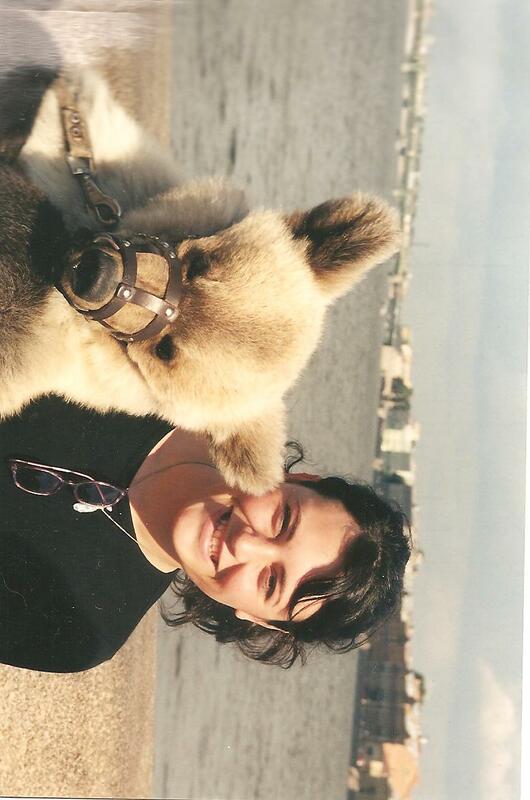 Although, that bear doesn’t look too happy to be muzzled! I know I wouldn’t like it either…..